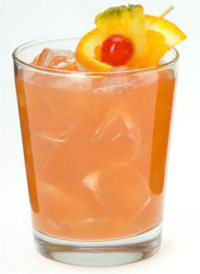 September 20th is National Rum Punch Day, an appropriate celebration to send off the summer months. When it comes to choosing a rum with which to celebrate, the answer is as clear as Caribbean waters. Gosling’s Rums are synonymous with Bermuda and add that island touch to any cocktail. No drink captured the essence of National Rum Punch Day better than the Bermuda Rum Swizzle. Made with Gosling’s Black Seal, Gosling’s Gold Rum and a blend of fruit juices, the Rum Swizzle will give you sunny skies long after summer’s end. Shake vigorously in an ice-filled shaker. Pour into a double old-fashioned glass filled with ice. This entry was posted on September 20, 2010 at 12:14 am and is filed under Beverages. You can follow any responses to this entry through the RSS 2.0 feed. You can leave a response, or trackback from your own site.